S&W Assist Swat Small Drop Point Knife Serrated | BUDK.com - Knives & Swords At The Lowest Prices! 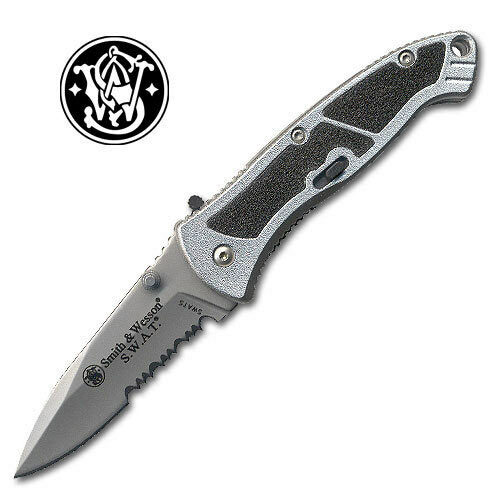 This Smith & Wesson SWAT Assisted-open knife is the perfect addition to your pocket arsenal. The handle offers a grippy, sandpaper like insert that virtually sticks to your fingers and the 2 1/2” 4034 stainless steel blade is razor-sharp with partial serrations. The blade opens lightning fast by using the thumb stud or back blade flipper. A safety lock ensures you will only open the blade when you intend to do so and a sturdy stainless steel pocket clip will hold it close by your side. 3/14” cl.